Farrar, Straus and Giroux, 9780374533991, 656pp. An estimated thirty-six million Chinese men, women, and children starved to death during China's Great Leap Forward in the late 1950s and early '60s. One of the greatest tragedies of the twentieth century, the famine is poorly understood, and in China is still euphemistically referred to as "the three years of natural disaster." As a journalist with privileged access to official and unofficial sources, Yang Jisheng spent twenty years piecing together the events that led to mass nationwide starvation, including the death of his own father. Finding no natural causes, Yang attributes responsibility for the deaths to China's totalitarian system and the refusal of officials at every level to value human life over ideology and self-interest. Tombstone is a testament to inhumanity and occasional heroism that pits collective memory against the historical amnesia imposed by those in power. Stunning in scale and arresting in its detailed account of the staggering human cost of this tragedy, Tombstone is written both as a memorial to the lives lost—an enduring tombstone in memory of the dead—and in hopeful anticipation of the final demise of the totalitarian system. 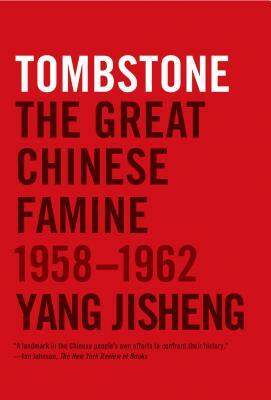 Ian Johnson, writing in The New York Review of Books, called the Chinese edition of Tombstone "groundbreaking . . . One of the most important books to come out of China in recent years." Yang Jisheng was born in 1940, joined the Communist Party in 1964, and worked for the Xinhua News Agency from January 1968 until his retirement in 2001. He is now a deputy editor at Yanhuang Chunqiu (Chronicles of History), an official journal that regularly skirts censorship with articles on controversial political topics. He is the author of the book Tombstone. Edward Friedman is Professor of Political Science at the University of Wisconsin, Madison. He is co-editor of Asia's Giants: Comparing China and India with Bruce Gilley. Stacy Mosher learned Chinese in Hong Kong, where she lived for nearly 18 years. She is the co-translator of Yang Jisheng's Tombstone. A long-time journalist, Mosher currently works as an editor and translator in Brooklyn. Guo Jian is Professor of English at the University of Wisconsin-Whitewater. Originally trained in Chinese language and literature, Guo was on the Chinese faculty of Beijing Normal University until he came to the United States to study for his PhD in English in the mid-1980’s. He was a translator of Yang Jisheng's Tombstone.